Hellooo. Question.... in my profile here it has my age at 40. But i am 41 and will be 42...april next year. My birthdate is actually correct but its like the counter stopped at 40. How or can this be fixed? your birthdate says you were born on 4-10-1974, that means you are 41 on the next day 4, not before. It is possible that he switched the month and day when inputting it in his profile. I've been browsing the forum on my phone for a few months without any issue, but since the last wave of error 500s last Monday, the CSS seems to be off. There's a line with yes/no/ok buttons at the top of all page, and a bunch of background images (the black triangle that goes under the G of the logo on top and above the "search" button left of the "your profile - inbox" etc. 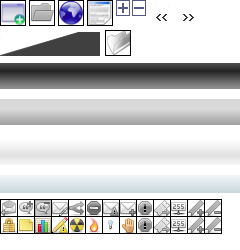 buttons, black bar, white bar, light blue bar, then a bunch of icons, topic icons, quote/reply/etc. Icons, hot topic, locked topic, font size, facebook etc.) repeat in a lot of different places, in the description of every section that has child forums, then in the lost of topics, then at the bottom of every post and so on, making the forum very hard to browse. Doesn't happen on my laptop. Maybe a CSS thing specific to phones, it's not loading entirely, maybe it lost some stylesheet sections. I'm using the http address, not https. I know you probably tried this already but I'm going to suggest it anyway. Have you tried completely closing out your browser on your phone and/or cleared your cache? IIRC you have an Android phone so I'm not 100% sure if it'd work. I've had similar happen on my iPhone and it fixed it. I have a BlackBerry. I haven't tried my Android tablet. I closed it a few times since, yeah. Rebooted and cleared everything just now to be sure, no difference. It's weird that it's only on my phone, but it started with the 500 errors the other day, so I was wondering if there wasn't a link to a sheet that broke or changed or something, and only my phone wasn't able to refresh it. ... And... fixed. I closed it a couple more times after clearing and rebooting again and now it works. Go figure. I guess BlackBerry just doesn't instantly wipe stuff when you ask it to and it says "done", you still have to try again. In a nutshell, Val wants to move us back to vanilla SMF but doesn,t have time. Anyone know php that'd like to help? Still considering the SMF move? valodim: if someone wants to do this, I can set up a working environment and assist with questions, but the person should "know php" and not only "know what php is"
So I'm lazy. Just not too lazy. These might be unusable as they stand, but I tried to figure out the best way to do the FF3 icons. This is probably the most useful individual image. I can upload each icon if that'd be best? The only thing I didnt think to include is the Find/replace bar. Late but thank you for making the sections as well as "Recent posts" collapsible. Still, thank you. It's a good idea.